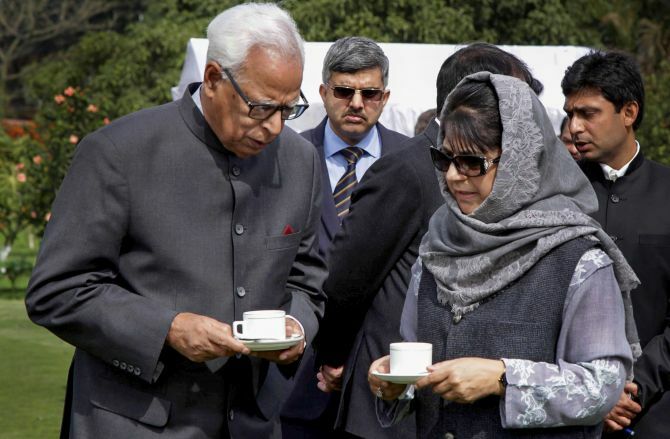 Jammu and Kashmir was placed under Governor's rule on Wednesday and the state assembly kept in suspended animation, as Governor N N Vohra reviewed security measures and brought in former top cop Vijay Kumar, a counter-insurgency specialist, as one of his two advisers. A day after the People's Democratic Party government collapsed after the Bharatiya Janata Party snapped its three-year-old alliance with the regional party citing 'larger national interest' and 'deteriorating security situation', a Union home ministry spokesman said in the morning that President Ram Nath Kovind has approved imposition of Governor's rule in the border state with immediate effect. As Vohra held multiple meetings in Srinagar, Army chief Gen Bipin Rawat said the ongoing military operations in the Valley against terrorists would continue as earlier. Governor's rule in the state is unlikely to have any impact on ongoing military operations, he told reporters in New Delhi. According to an official communique, Chhattisgarh cadre Indian Administrative Service officer B V R Subrahmanyam was appointed as the chief secretary of the state in place of B B Vyas, who along with K Vijay Kumar, a former Indian Police Services officer and an anti-Naxal expert, were named advisers to Governor Vohra. Kumar's experience ranges from jungle warfare and security detail to counter-insurgency. The names of advisers were cleared by the MHA after the state was put under the Governor's rule. Kumar, a 1975 batch IPS officer of Tamil Nadu cadre, had earlier served in the Kashmir valley as Inspector General of Border Security Force in 1998-2001 when the border guarding force was actively involved in the counter-militancy operations. Kumar, 65, had shot to fame when he headed the Special Task Force for a long time and strategised operations that culminated in the elimination of the dreaded forest brigand Veerappan after an encounter in Tamil Nadu in October 2004. He was later appointed as Director General of world's largest paramilitary force -- CRPF-- after Naxals killed 75 personnel in Dantewada in 2010. It is for the fourth time that J and K was placed under Central rule in the last one decade--all under the tenure of Vohra, who was made the Governor in June 2008. This is the eighth time in the last four decades that the state was kept under Governor's rule. "Immediately after receiving President of India's approval, Governor N N Vohra issued the proclamation to impose Governor's Rule in the state under section 92 of the Constitution of Jammu and Kashmir today," a Raj Bhawan spokesman said in Srinagar. The Governor also placed the legislative assembly in suspended animation till the proclamation of Governor's rule is revoked or varied by a subsequent proclamation, according to a gazette notification. The six-year term of the current Assembly ends in March, 2021. As part of the Governor's meetings, Northern Army commander Lt Gen Ranbir Singh called on Vohra and discussed the security situation in the state. The Governor and the Army commander discussed certain issues about the need for very close coordination in security management in the Valley, particularly keeping in view the need to prevent collateral damage in counter-terrorist operations, the Raj Bhavan spokesman said. Separately, Union Home Minister Rajnath Singh said the Centre wants terrorism to end and peace to prevail in Kashmir. "Our only aim is that terrorism should end and peace should prevail in Kashmir and our government will work keeping this in mind," he told reporters in Lucknow. Vohra had on Tuesday night recommended imposition of Governor's rule in a report sent to the Rashtrapati Bhavan around the time when President Ram Nath Kovind, who is on an overseas trip, was on board his special aircraft. The contents of the Governor's report were immediately sent to Suriname where the president was scheduled to land at 6.30 pm (3 am IST). The president after perusing the report gave his assent and tiahe same was sent to the Union Home Ministry by 6 am (IST) following which the process of promulgating Governor's rule was initiated and a communication sent to Srinagar. After assuming charge as the head of the state administration, Vohra held meetings with top civil administration and police officials at the Civil Secretariat in Srinagar. Security preparations for the annual Amarnath yatra also figured during the meetings held by the Governor. The two-month long pilgrimage to the 3,880 metre high cave shrine of Amarnath commences on June 28. Vohra held meetings with top civil administration and police officials at the Civil Secretariat in Srinagar on Wednesday. He held discussions with Vyas and identified the major tasks which shall require to be dealt with on a strict time-bound basis, beginning from Wednesday. Vohra asked the chief secretary to forward by Thursday department-wise lists of all pending cases with remarks regarding the reasons for delay. Meanwhile, Northern Army commander Lt Gen Ranbir Singh, called on the governor and discussed the security situation in the state. The Governor and the Army commander discussed issues regarding the need for very close coordination in security management in the Valley, particularly keeping in view the need to ensure against co-lateral damage in counter-terrorist operations.